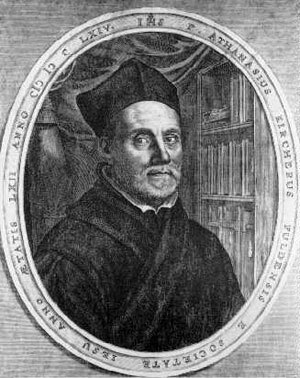 The german Athanasius Kircher (1602-1680) (see biography of Athanasius Kircher) was a famous 17th century Jesuit scholar, who published around 40 works, most notably in the fields of oriental studies, geology, medicine and music theory. Kircher's best-known work today is his Oedipus Aegyptiacus (1652–54)—a vast study of Egyptology and comparative religion. His books, written in Latin (which was the common scientific language then), had a wide circulation in the 17th century, and they contributed to the dissemination of scientific information to a broader circle of readers. The name of Kircher is repeatedly mentioned in other articles of this site—e.g. in Napier's Bones, concerning his Organum Mathematicum, as well as in Kircher's automata. Most of his life Kircher lived in Rome (from 1635), where he was to stay, until his death, at the Jesuit Roman College. There the philosopher was very much in the right place at the right time! From 1638 onwards Kircher was professor in mathematics at the Roman college, but his interest covered everything under the sun, (there were still such Renaissance men in the 17th century, let's remember only Leibniz). When he was released from teaching duties after 8 years, he started publishing books, concentrating on a different subject every three to four years. He received visits or letters from scientists, royalty and clergy from all over Europe and beyond, together with a multitude of artifacts, curiosities of natural history and mechanical apparatus. These, together with his huge library, he later donated to a museum, which eventually became the famous museum of the Roman College or the Museum Kircherianum. This museum became one of the top attractions of Rome in the 17th century. The interesting for us event happened in 1669, when Kircher published in Amsterdam his book Ars Magna Sciendi, Sive Combinatoria (see the lower image). In the third chapter of this book is presented a new and universal version of the Llullistic method of combination of notions. Kircher seems to be convinced that the Llullistic art of combination is a secret and mystical matter, some kind of esoteric doctrine. 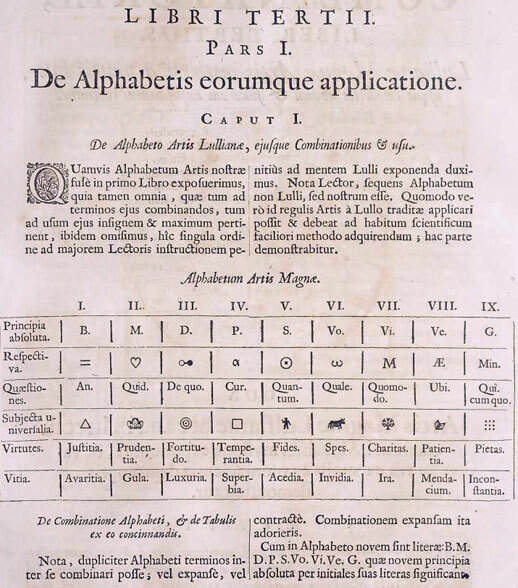 Kircher used the same circle-figures of Llull, but the alphabet which Kircher proposes as material for his combination-machine reveals the difference to Lullus' at first sight (see the figure bellow). It is not the signification in correlation with the position in the table, because all nine places in each table are filled with the same significations we find in the Llullistic tables, that makes the difference. It is the notation, which creates the difference. 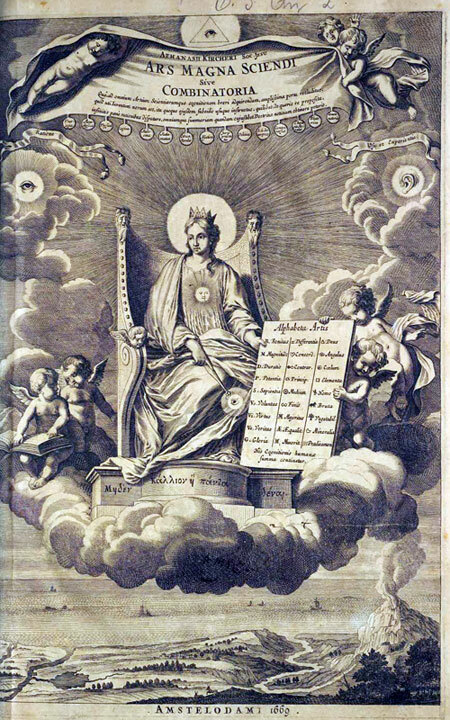 In contrast with Llull, who used Latin words, words with clearly defined significations for his combinations, Kircher began filling the tables with signs and symbols of a different kind. This means, that he attempted to solve problems other than the demonstration of the truth, which the Catholic Church had claimed. 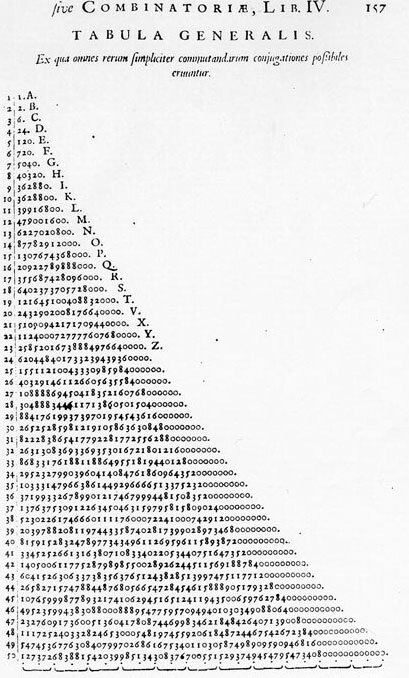 Furthermore, as can be seen from the following figure, Kircher tried to calculate the possible combinations of all limited alphabets (not only graphical, but also mathematical). As it is known, that at that time Kircher was a grand master of decipherment and tried to translate Egyptian hieroglyphic texts, it is clear that this schema can be connected to the process of encoding and decoding. Regarding his tabula generalis, the more mathematical way of thinking created the great difference between Llull and Kircher. Kircher consequently published a book about the problems of encoding and decoding, and he even designed mechanical machines for the task. In addition, he himself collected machines and automata of different kinds: optical and acoustic machines, music boxes, hydraulic and astronomical machines, clockworks, tools and toys, mechanical puppets, and so on. This collection will became a foundation for the famous Museum Kircherianum.